Good afternoon! I want to first start off by sharing some proud news. 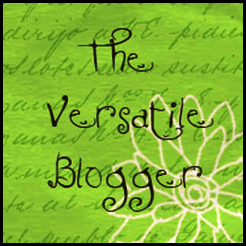 I have received The Versatile Blogger award from Karen over at Little Scrap Pieces. Thank you so much Karen!! I am so proud that you chose me as one to receive this award. I love checking out her blog. If you haven't done so already to check out Little Scrap Pieces. Include a link to their blog. That's also common courtesy-if you can figure how to do it. Next, select up to 16 blogs/bloggers that you've recently discovered or follow regularly. Nominate those bloggers for the Versatile Blogger Award-you should include a link to their site for others to see how versatile they really are. Finally, tell the person who nominated you "7 things about yourself." I have two Yorkies, a 7 year old male and 6 year old female that are spoiled rotten. I have been with my husband my entire adult life. I love making cake pops. Thank you so much for the award Amy! I'm honored!